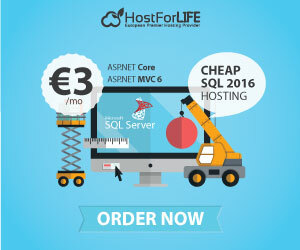 SQL Server 2016 Hosting - HostForLIFE.eu :: How to Convert String To Color in SQL Server 2016? -- we need to do an explicit cast with substring for proper string conversion. OnceSQL Server Full-Text Search with rank values I wrote a post titled enabling Fulltext search in Azure SQL database discussing Full-Text search in Azure. while using it with one of my databases, needed to show the result of the search ordered by however well they match to the search criteria. in order to sort the result as i need, the best is, get a rank generated for every row and use it for ordering the result. I had used Freetext operate for obtaining the result but if i realized that this can not be achieved using the Freetext function. The CONTAINSTABLE and FREETEXTTABLE functions return a column named Rank for showing the rank related to the record based on matching. this can be used get the result sorted based on it, showing most relevant records at the top. Remember, the higher value of the Rank generated indicates the best matching.